I am the student of B.B.M II Year of Adikavi Nannaya University as exams are very near and my preparation is complete upto the level so now I want to solve the previous year question paper can you please provide me this so that I can prepare well for the exam? Hii sir, I Wants to get the Question Paper of the BA III Year Computer Application Paper Data Base Management System Adikavi Nannaya University ? Adikavi Nannaya University is a state university located in Rajahmundry in Andhra Pradesh, India. Adikavi Nannaya University was established in March 2006 through the Government of Andhra Pradesh Act No. 28 of 2006. 1. a) What is Database system? Explain file oriented Database? b) Explain different Data Models and their importance? b) What is the need for normalization on Database Design? 3. a) Explain different commands of DDL and DML with an example? b) Explain the difference between Sub Queries and Correlated Queries? 4. a) Explain about the System Development Life Cycle? b) Explain about the Distributed Database Design? 5. Explain about Data Dictionary? 6. What is DBMS and its advantages? 7. Explain about the star schema? 8. Explain SQL join operators? 9. Explain about the De normalization? 10. Write about Database Recovery management? 12. 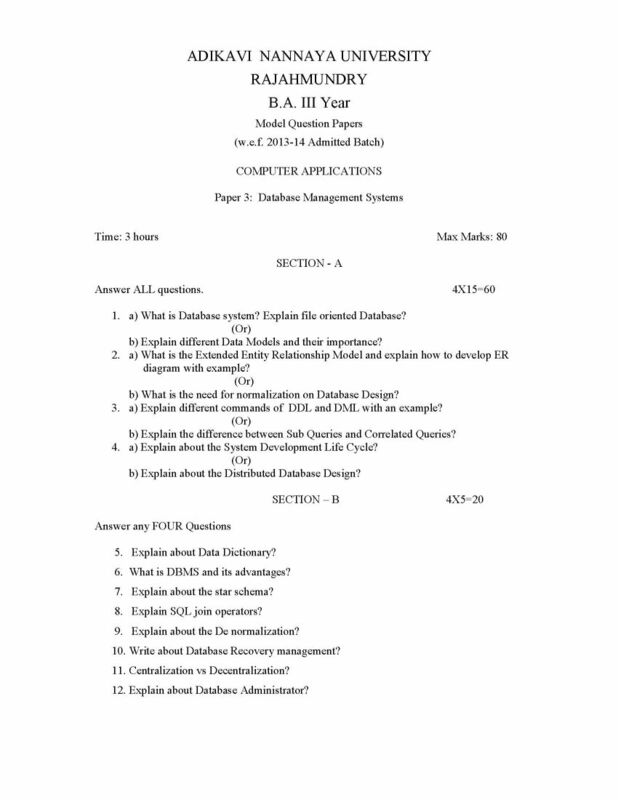 Explain about Database Administrator?